According to the 2012 Employment Survey by well-known HR Services firm Ma Fio Randstad, the sectors publishing most jobs in the country in 2012 are Healthcare, Hospitality and IT/ITeS. These three sectors will together create more than 7.31 lakh new jobs in the country, out of the total 1.6 million new jobs estimated to be created in the organized sector this year. The exact breakup of the top 3 sectors is as follows: Healthcare (273,571 jobs), Hospitality (230,213 jobs) and IT/ITES (227,328 jobs). Apart from these, the other sectors optimistic about hiring in the year 2012 are Non-machinery Manufacturing (such as food and beverages, basic metal, fabricated metal, textiles, wood products, chemicals and rubber) and Media & entertainment. In terms of number of jobs expected to be created Manufacturing (non-machinery products), Media & entertainment and Real estate & construction sectors expect to add more than 1 lakh jobs each. In 2011, the survey had estimated creation of about 1.6 million jobs during the year, but the actual number stood at 1.4 million. “However, data for the last quarter of calendar year 2011 shows that 0.36 million jobs were generated as against an expectation of 0.33 million, indicating positive growth towards the end of the year,” this year’s survey says. 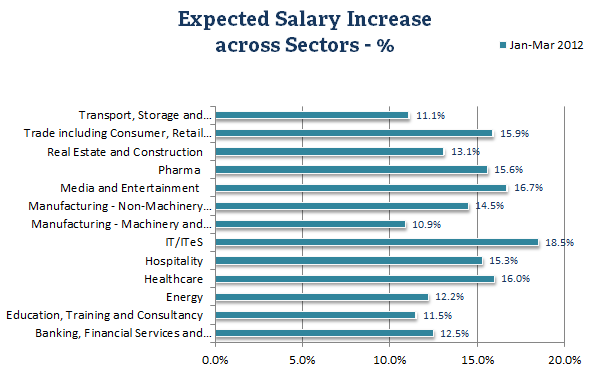 Among all verticals, IT/ITeS, Media and Healthcare outperform all other sectors in terms of salary growth with an increase of greater than 16% in each. 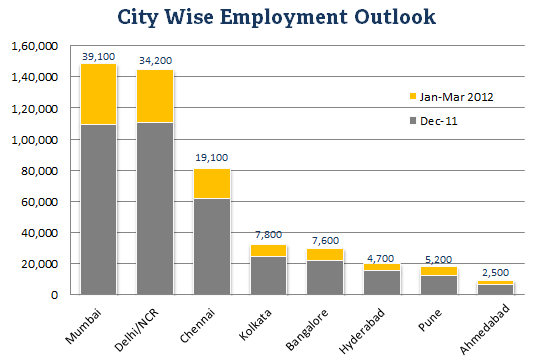 MEtS surveyed 639 companies across 13 industry sectors in eight major Indian cities.